For several years, the U.S. Postal Service, which was shedding billions of dollars a year -- nearly $16 billion in 2012 -- has pushed Congress for legislation that would cut costs and boost revenue. Postal Service officials put a number of money-saving options on the table: raising the price of postage stamps, discontinuing mail delivery on Saturdays, even abandoning door-to-door service altogether in favor of central drop-off spots. They urged a change to the service's biggest financial burden, a 2006 law that requires the federal agency to prepay 75 years' worth of employee retirement benefits, about $8 billion a year, payments the Postal Service defaulted on last month. Help could come only from Congress, which outlines what the Postal Service can and can't do. "There's not a lot of people in the private sector that want to get into our kind of business with those kinds of requirements," U.S. Postmaster General Patrick Donahoe told The Wall Street Journal in September. "So we need Congress to act." But as we learned this week, that's not the case. The Postal Service announced Monday that it began delivering Amazon.com packages to residential addresses in Los Angeles and the New York metropolitan area and would eventually expand the service to other cities. The agency already delivers some priority mail on Sundays, as well as packages during peak holiday season in cities in December. So the help the agency sought to pinch pennies and turn a profit didn't come from the Hill. It came from a private company with a growing knack for rescuing operations in precarious financial situations, one that The Washington Post's Lydia DePillis says may as well buy the entire mail service. Details of the deal, including how much Amazon will pay the Postal Service, are not public, so we don't know how it affects the agency's budget, or if the partnership will deliver as much revenue as discontinuing Saturday service or charging more for stamps would have. The new partnership is an unusual one. It's an example of what Brian Fung of The Washington Post dubbed "reverse contracting" on Monday, in which a private company hires a government agency to meet its needs, instead of the other way around. The deal opens a new line of business for the Postal Service, through which it can compete with its biggest competitors, like FedEx and UPS, which do not deliver on Sundays. It also may not keep the Postal Service from playing favorites, and it's unlikely the agency would shun other private-sector companies following Amazon's lead, if the money is there. The responsibility of saving the Postal Service may, in the future, may not rest with Congress. That's what happened this week with Amazon. The key was tapping an option that doesn't require congressional approval. "We cannot decrease a delivery day without legislation," USPS spokeswoman Sue Brennan told National Journal in an email. "We can increase delivery on our own." Despite losses, the Postal Service continues to see strong increases in package delivery. Brennan said the agreement "has nothing to do with the Postal Service's need for legislation." But lawmakers, heeding the postmaster general's call, have tried this year to push through legislation that would help resolve the agency's financial woes. 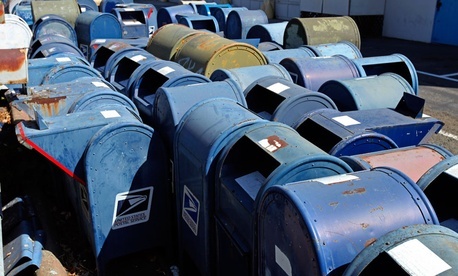 A bill that would end Saturday mail service, saving the agency $2 billion a year, introduced by Rep. Darrell Issa, R-Calif., passed the House in late July. The Senate hasn't touched it, likely because it doesn't include provisions for reforming the 2006 benefits law. "Congress needs to pass the Postal Reform Act, so postal customers no longer are made to subsidize unused paper mail processing and delivery," Issa said Tuesday in a statement to National Journal. In the Senate, Thomas Carper, D-Del., and Tom Coburn, R-Okla., introduced legislation in August that would change the retirement benefits law, cut Saturday delivery, and scale back service in some areas. But it remains in committee. Carper said in a statement Monday that the Postal Service's partnership with Amazon "offers a great deal of promise." "Ultimately, Congress must give the Postal Service the tools, resources, and flexibility it needs so it can right its financial ship and continue to implement forward-thinking ideas like this one," he said. Sen. Bernie Sanders, I-Vt., who has introduced legislation that would preserve Saturday mail service but repeal the "onerous" law on retirement funds, said the partnership "makes sense to me." "The Postal Service needs a new business model which gives it more flexibility to raise revenue," Sanders told National Journal. "And, in many ways, the postal service is having their hands tied behind their backs in their ability to compete in the marketplace." The senator wants Congress to repeal the 2006 law. When asked about the Postal Service's unusual decision to circumvent Congress in the search for new business, the senator simply said, "That is a good point." Brennan said she did not know who approached whom about negotiating the Amazon-USPS partnership, which "began months ago" and was "collaborative." The U.S. Postal Regulatory Commission filed the agreement in early October. The Postal Service said Monday it considered the new partnership a win-win. Congress, it seems, isn't even in the game.